PINEHURST, N.C. — My frequent golf travels have led me to introduce you to a term you’re certain to hear more about in the next few months and years. It’s called wire-grass, the key ingredient in the recent renovation of North Carolina’s Pinehurst No. 2 — one of the world’s most famous courses, as well as one of my all-time favorites. Pinehurst is certainly no secret. It’s been welcoming guests since 1895 and is America’s largest golf resort with its eight courses. The insertion of wire-grass on its famed No. 2 course, though, is something new and significant. While the topic of wire-grass hasn’t been talked about much yet, it will be. The U.S. 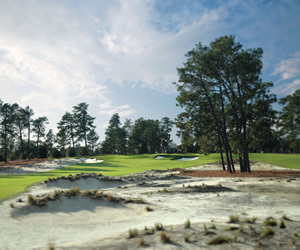 Golf Assn., in an unprecedented move, has scheduled for the U.S. Open and U.S. Women’s Open at Pinehurst in 2014. By then wire-grass will be a well-known golf term. Wire-grass doesn’t look all that great, but that’s what Donald Ross — the famed architect of the early 1900s — worked with in creating his layout at Pinehurst No. 2. Sweeting tells me that wire-grass is very indigenous to the sandhills of North Carolina. The fact that it was allowed to grow at Pinehurst No. 2 certainly changed the look of the course that hosted U.S. Opens in 1999 and 2005. I covered both. For those events the rough was bermuda, just like the fairways, only longer. Pinehurst had a pristine look then. Now it’s more traditional and the rough is more unpredictable for golfers. Maybe some golfers won’t like the new look, but I did because Ross is one of the all-time great architects whose work has withstood the tests of time. He lived off the No. 3 hole at Pinehurst No. 2 before his death in 1948.